Special Publication of the LEC. Artwork: Reproductions of various LEC editions. Introduced by Robert L. Dothard. Critique by Paul Beaujon, Paul A. Bennett, Edward Alden Jewell, James Laver, Thomas Craven and John T. Winterich. 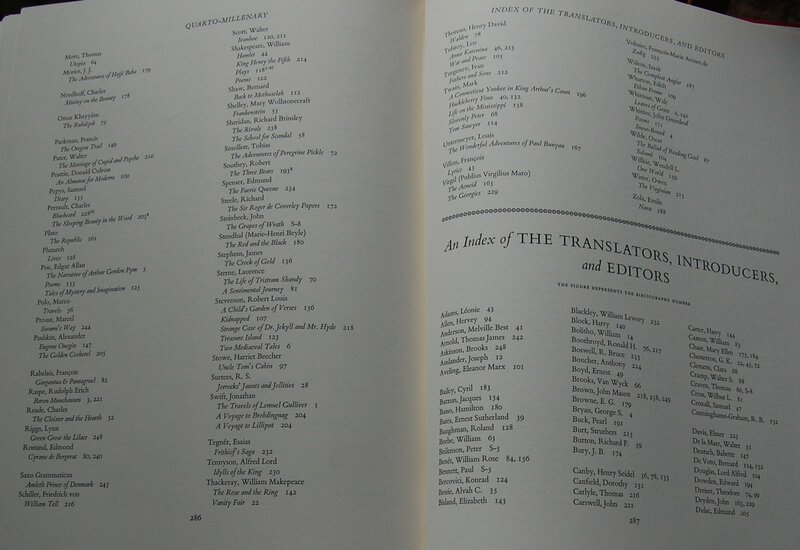 Commentary in the Bibliography by George Macy. LEC #114 of 2250 (1500 for membership, 750 for distribution outside of the Club). LEC exclusive. Front Binding – Long time no see! As you may have gathered, my life was not in a place where I could devote much time to covering the publications of the George Macy Company and its handlers; to be brief, I recently separated from my wife amiably after discovering that we weren’t happy together any more. Don’t worry, though — I’m doing fine and am finally at a good point to pick up this project once again (good thing, too, as I’m getting backlogged!). 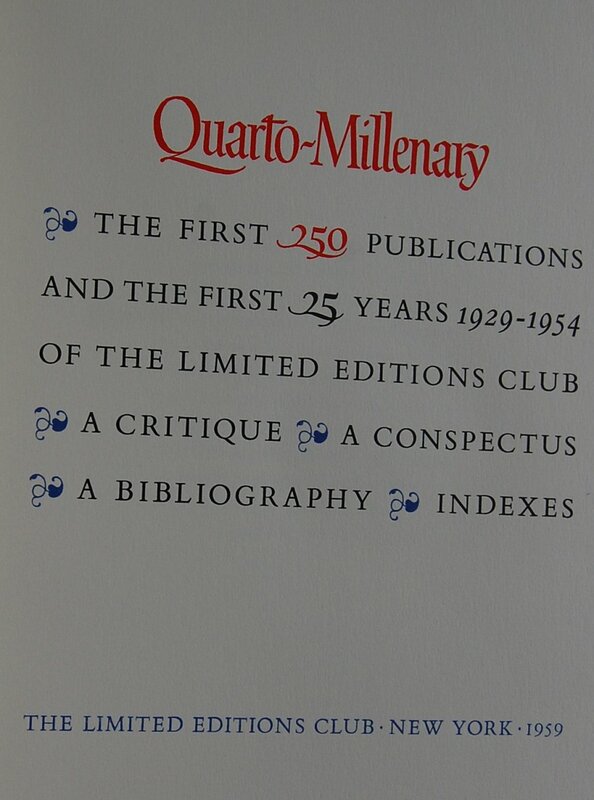 Our book today is the Quarto-Millenary, a thorough and wonderful resource for any collector interested in the Limited Editions Club under George Macy’s tenure. Issued in 1959 as a special publication, it finishes the dream of Macy to properly archive the history of his Club at a crucial point of its lifeline, and stops just short of the end of the 23rd series’ conclusion in 1955. Unfortunately, Macy passed away in 1956, leaving it unfinished; thankfully, publisher Robert L. Dothard explains how the book came to be in his Introduction. According to Dothard, Macy got the idea to cover the entirety of the LEC enterprise after the Shakespeare set issued its own record, Ten Years and William Shakespeare. He desired to mirror the format of that little book: a collection of critical commentary on literature, fine printing, and as illustrated tomes; next, he planned to provide several photographs of the work of the Club as an example of how he felt the art should be produced; next, the bibliography, complete with Macy’s thoughts and insights into most of the editions issued; and last, a proper index. As the 250th volume of the Club approached, he began in earnest this project. 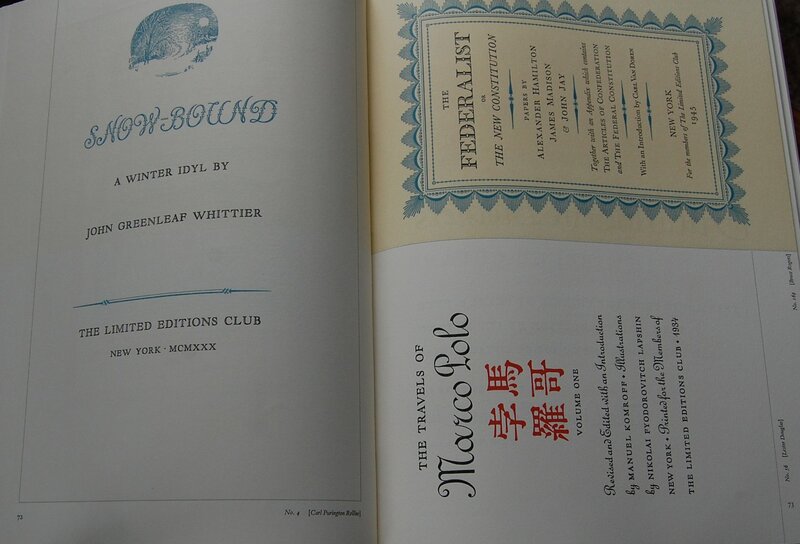 He wanted a comprehensive survey of his Club, done up as detailed above, with his personal selections for the pages to represent the Club’s artistic merits as fine press books, with the pages to be reprinted exactly as they originally were. The critique was called for from major essayists of the day, and the beginning of Macy’s detailed bibliography took form. He coined the title, and started the immense selection of the representations to be included…but alas, time ran out for Macy before he could get the project completely off the ground. Stalled, Helen Macy stepped in and recruited Dothard to take over the design and publication of the book. With the assistance of Max M. Stein, production manager for the LEC, and Yetta Arenstein, who assisted editing the Bibliography and Indexes, Dothard completed the monumental task of Macy’s dream archival record in 1959. The book is formatted as such: Critique, provided by several key contributors (including John T. Winterich, who has written several forewords and possibly even some letters for the Club! We’ve seen him plenty over the years); Conspectus (the collection of images from the many books from the Club); Bibliography, and Indexes. It’s a lovely history of George’s era of the Club, arguably its finest in its long line, and is definitely worth checking out if you’re into Macy’s publications. 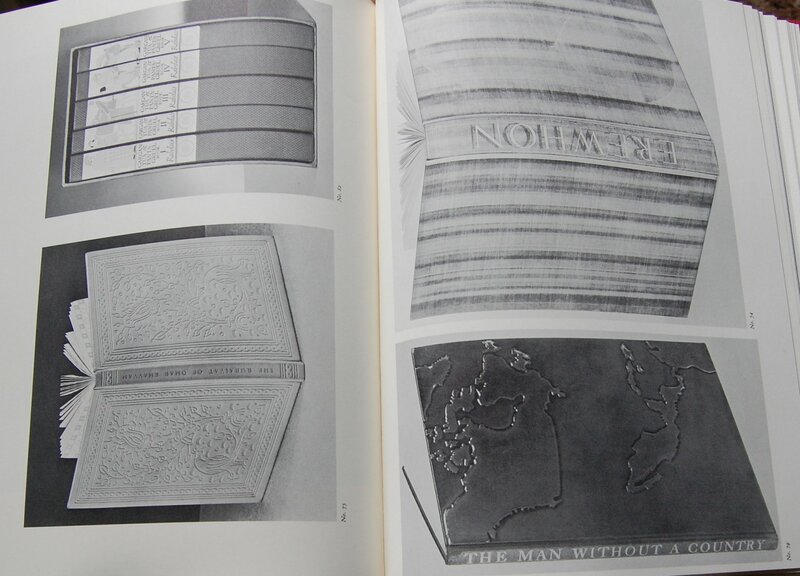 Design Notes – As noted, Dothard was the primary designer of the book, taking cues from Macy’s original plan but acting on his own to execute it. 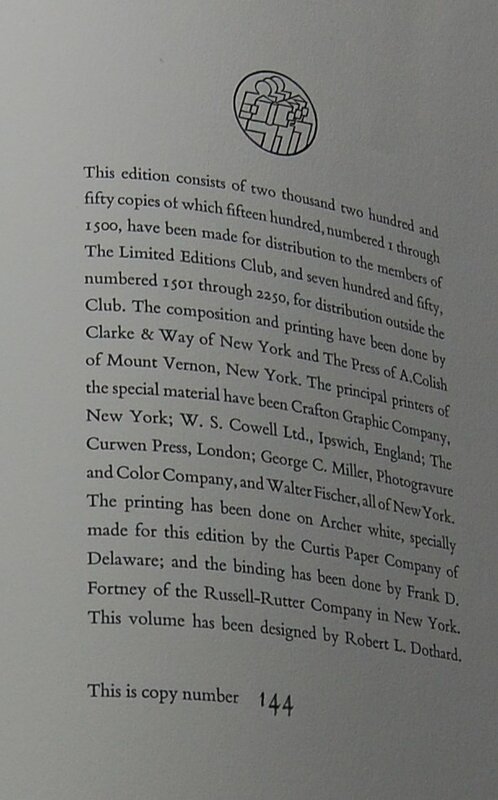 A. Colish and Clarke & Way handled the text composition and printing, while a multitude of illustration printers tackled the reprinted Conspectus: Crafton Graphic Company, W.S. Cowell Ltd., The Curwen Press, George C. Miller, Photogravure and Color Company, and Walter Fischer. The paper is an Archer white provided by the Curtis Paper Company, and the binding was done by Russell-Rutter’s Frank Fortney (by the way, 170 of the volumes featured were bound by Fortney, so no wonder his name pops up so often!). Title Page – A simple yet dainty design with a lot of color. Nice! 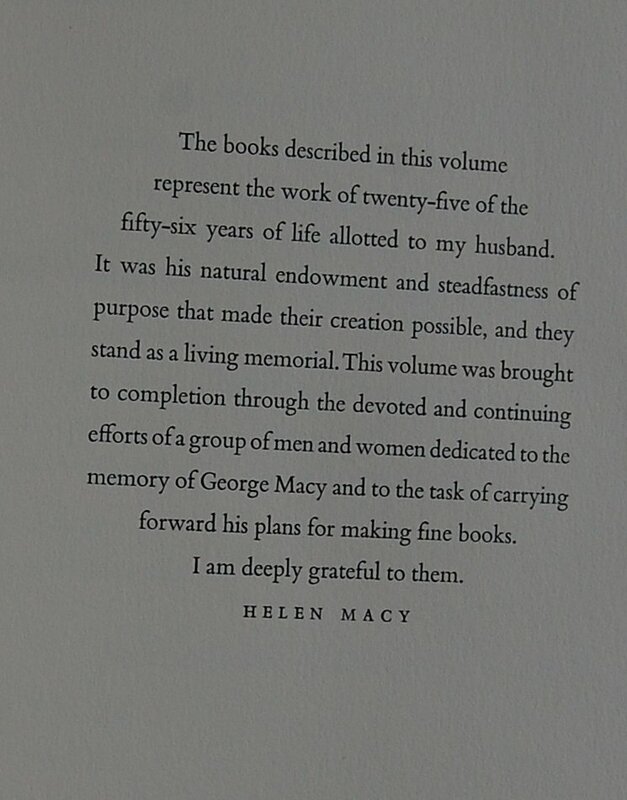 Dedication – Helen Macy provides some generous words about her husband and the people responsible for the publication of this and future books. Colophon – This exceeded the usual 1500 publication limit by 750, more than likely to distribute to crucial repositories and libraries. This is #144 of the 1500 allotted to the membership. 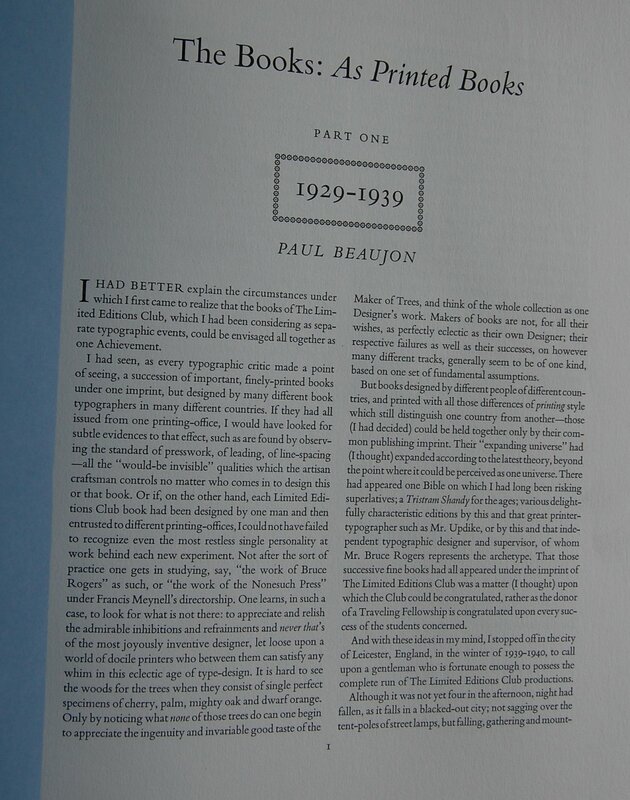 Page 1 – Example of the Critique section. Pages 72-73 – Example of the Title Page section of the Conspectus. 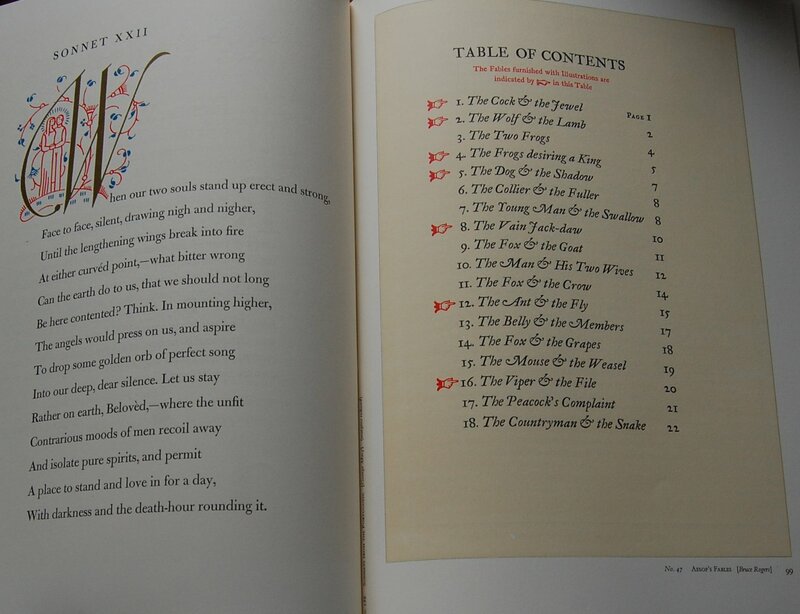 Pages 99-100 – Examples of the text in the Conspectus for the Songs of the Portuguese (left) and Aseop’s Fables (right). 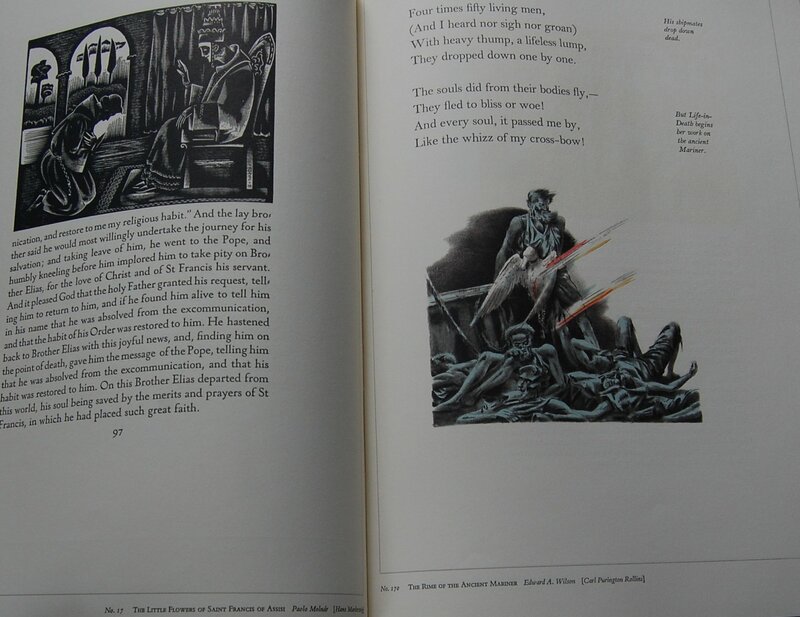 Pages 118-119 – Examples of the Illustration section of the Conspectus, with The Little Flowers of Saint Francis of Assisi (Paolo Molnar, left) and The Rime of the Ancient Mariner (Edward A. Wilson, right). Pages 214-215 – Examples of the bindings in the Conspectus. 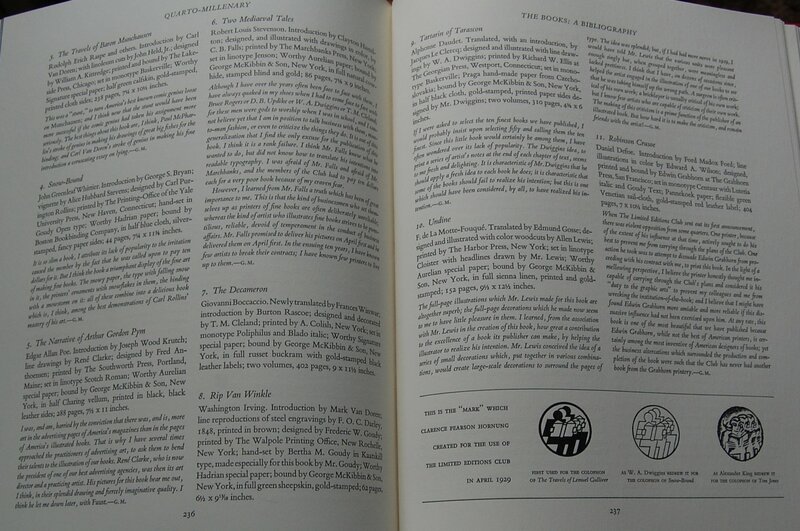 Pages 236-237 – Example of the Bibliography. Pages 286-287 – Example of the Indexes. Personal Notes – I got this from Carpe Diem Fine Books in Monterey a week or two back. I was astounded to see it; I was further shocked by the $75 price tag! That seemed so low to me that it was almost decided then and there to buy it. However, there was a 30% off sale (with the potential for it to go up to 50% if I could find five books! ), so I did dig around in the hopes of seeing if I could pull off some sort of amazing purchase of five LECs to get the greater discount. I did not, so immediately I went back and grabbed this. The good news is that the other LEC I found, The Three Plays of Ibsen, ended up being essentially free thanks to the combined 30% discount, so I have double the reason to be merry about acquiring this lovely resource! PS – Macy’s notes will likely be an Of Interest post in the future! I’m not sure if this came with Monthly Letter — I will find out and report back with it if possible. Thanks, Jerry–an invaluable record of the huge accomplishment of George Macy, an achievement unparalleled in book design in the 20th century (and in the foreseeable future). There are many who feel that the greatest period of the LEC was under Sid Shiff, but although there are many treasures from that period, nothing matched the overall achievement of the Founder–in my opinion. 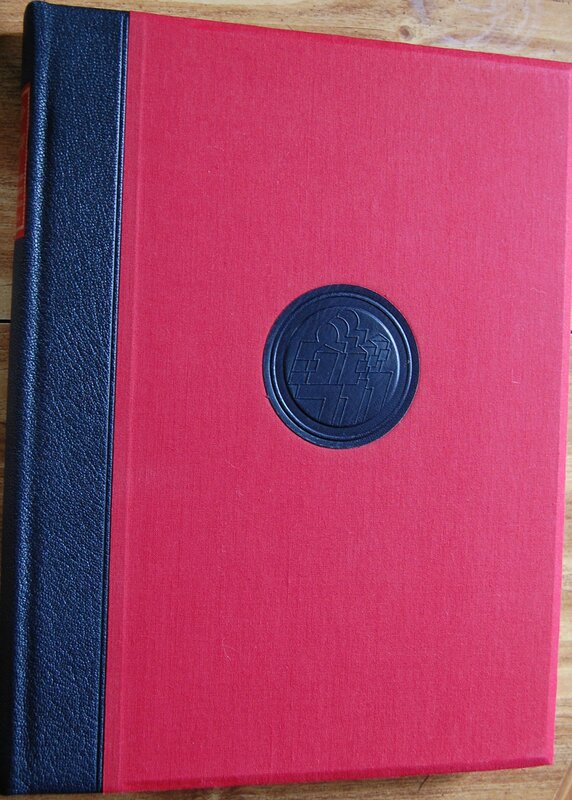 You are currently reading Limited Editions Club: Quarto-Millenary (1959) at The George Macy Imagery.